While doing some experimentation with my diet in the winter, I really missed our weekly takeout order of Pad Thai. Due to some restrictions, I wasn’t able to have it, so I decided to make a version that was friendly to my gut while still tasting delicious. Spoiler alert: This is my new favorite Pad Thai recipe that trumps takeout every time. It’s that good! This recipe is simple, requiring just 30 minutes to prepare! And LOOK at all those veggies! 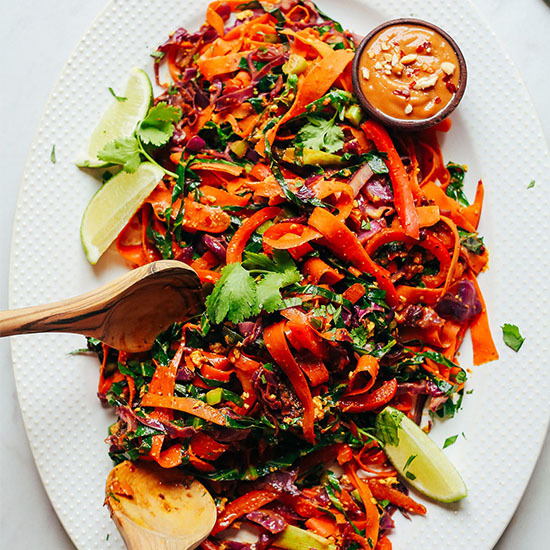 Noodle-free Pad Thai never looked so gorgeous and delicious. To replace traditional rice noodles, I went with carrot “noodles,” collard greens, thinly sliced bell pepper, and cabbage. Look at all those gorgeous plants you’re going to eat! And let’s not forget the sauce, which I played around with quite a bit until perfecting: almond butter, lime juice, coconut aminos (or tamari / soy sauce), maple syrup, and chili flake. That’s it! So simple, savory, spicy, sweet, and insanely delicious. For more “oomph,” I added a bit of crumbled tofu to mock the egg in traditional Pad Thai, but this is completely optional, especially if you’re soy-free. I even included some options below for those looking for soy-free protein sources! This would make the perfect weeknight meal when you want something satisfying and healthy on the table FAST. It is delicious on its own, but it would pair especially well with these Thai Spring Rolls, Thai Yellow Curry with Mango, and Curry Roasted Cashews. 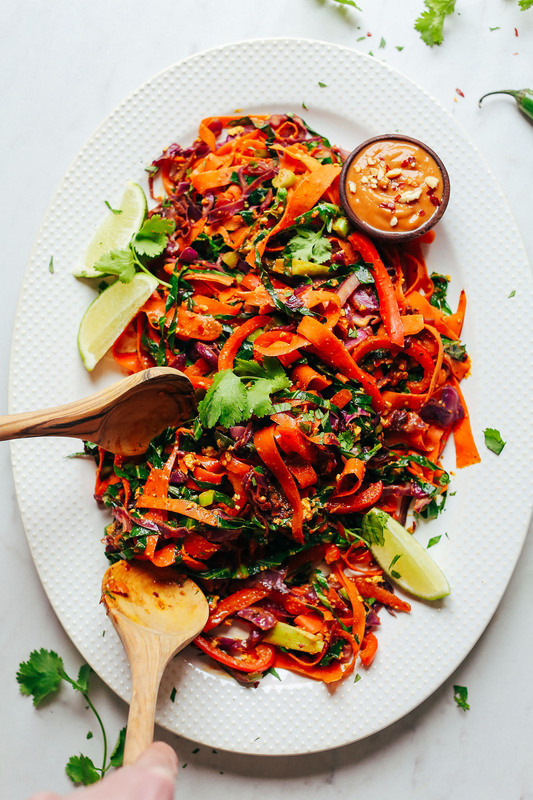 Amazing noodle-free Pad Thai with rainbow vegetables and a spicy-sweet almond butter sauce. Just 30 minutes required and SO versatile! If serving with tofu: Add tofu to a small mixing bowl and season with coconut aminos, chili garlic sauce (or pepper flake), and turmeric (optional). Stir and set aside. Add all sauce ingredients to a small mixing bowl and whisk to combine. 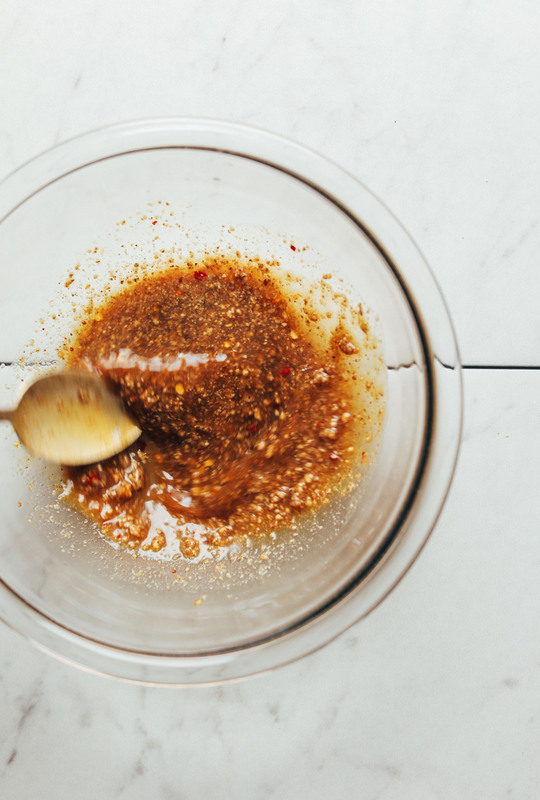 Taste and adjust flavor as needed, adding more lime juice for acidity, coconut aminos for saltiness, red pepper flake or chili sauce for heat, or maple syrup for sweetness. Set aside. Heat a large skillet over medium heat. Once hot, add oil (or water), pepper, onions, cabbage, bell pepper, and half of the coconut aminos for veggies (1 Tbsp as original recipe is written). Cook for 3 minutes, stirring/tossing frequently. Add tofu to a corner of the pan and sauté until slightly browned, stirring frequently - about 3-5 minutes. Add carrots and collard greens and remaining half of the coconut aminos for the veggies (1 Tbsp as original recipe is written) and stir. Sauté for 2 minutes. Then add Pad Thai sauce and freshly grated ginger and turmeric (optional). Sauté over medium heat until warmed through and collards are slightly wilted - about 3 minutes - stirring frequently. Taste and adjust flavor of dish as needed, adding more maple syrup for sweetness, red pepper flake or chili garlic for heat, coconut aminos for saltiness, or lime juice for acidity. Divide between serving plates and enjoy. Serve as is or with peanut sauce, crushed peanuts, cilantro, and lime wedges. Serves 2 as an entrée or 4 as a side. *You can easily remove the tofu from this dish to keep the recipe soy-free! Other protein options could include crushed peanuts/nuts, serving the dish over quinoa, or even sprinkling on some hemp seeds. *Nutrition information is a rough estimate calculated without additional garnishes or toppings. *This recipe is Pad Thai-inspired and not authentic. It is my healthier take on a classic dish I love and am always looking for ways to recreate. Looks amazing! I’m going to give it a try. Just a query, is that KJ or Kcal for the calories per serve? Well yum. 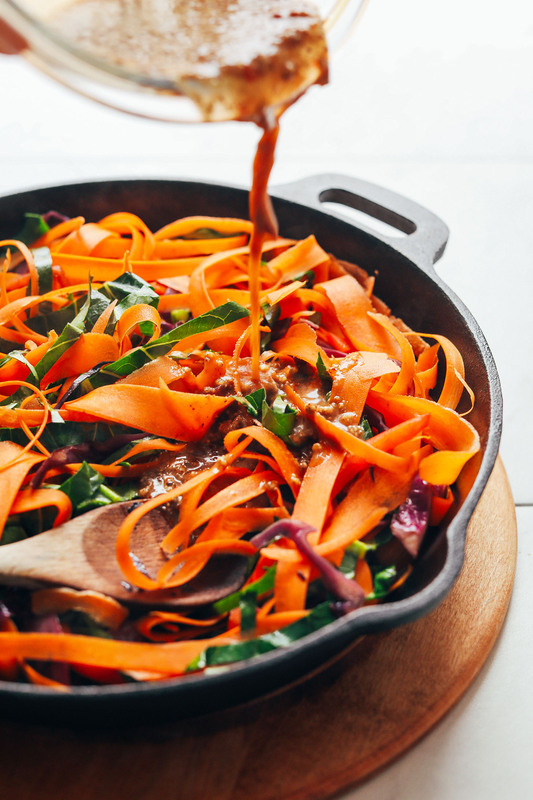 A delicious way to eat a lot of veggies for dinner, the colors are so beautiful and the sauce is just right. I also like that it is a lot less sodium than classic Pad Thai. I look forward to leftovers for lunch. Thanks for a great recipe! This was such an easy, yet really flavorful dish! We have ginger and turmeric on hand for our juices and added them to the recipe and it was outstanding. Really didn’t miss the noodles! Just finished this recipe tonight and loved it! We will make this again for sure. It was super easy to make and I had most of the ingredients in my kitchen. Two observations… I used the sunflower seed butter and that mixed with the coconut aminos made the final sauce fairly salty- not terrible by any means, but just something we noticed. (It was easy to fix with the addition of maple syrup). Second, I LOVED using collard greens as the “green” in this dish!!! Sometimes I will use spinach or bok choy in recipes and both are easily overcooked. The collard greens were durable, mild in flavor and hardy. Super great idea that I will use again. Thanks as always for your amazing recipes!!!! Just made this yesterday and it was yam!!! My partner introduced me to thai cuisine and pad thai is our favourite dish, so expectations were quite high. Well let’s just say, we loved it and will add it to our regular weekly cooking! Thank you so much for this recipe! One question: I used peanut butter but it comes with quite thick texture. So at the end the sauce wasn’t as runny as we’d like it to. Any ideas on how to adjust consistency? Add water or? So glad you both liked this, Ana! We would recommend thinning it with water. Alternatively, you could try blending the sauce to get it to be more smooth. Hope that helps! I loved the recipe! I cooked it last night! It is easy to make and most delicious. I used Tempeh instead of tofu. I love the nutty taste of tempeh…. This is absolutely delicious! One of my all time favs from yours. I will be making this regularly! I love this recipe! trying to adapt for a whole30 – suggestions on replacements for the maple syrup, if any? You can omit it in that case, though it will affect the flavor. I made this (it’s delicious, by the way) and substituted date paste for maple syrup. Delicious and it made it a little thicker which I didn’t mind at all! It’s a 5-er! I actually followed the recipe, it turned out great! Thanks so much for tonight’s inspiration! Don’t you already have an older noodle free pad thai recipe? Do you like this one better? Yes, we do! Both are delicious, but we prefer this newer version as it is packed with veggies and very flavorful! Left out collard Green but added Broccoli. Followed recipe exactly and it was delicious! Hubby and I ate all of it! This recipe is super easy to make and tastes great! 100% worth making it yourself as opposed to ordering takeout. I loved that the severing size is generous and that it doesn’t require special kitchen tools or odd ingredients. I love that you now have not only videos, but the adjustable serving amounts. My question is, for example, I am making the noodle free pad Thai and although the original servings or four I am adjusting it to 25. All of the amounts four ingredients adjust of course, but are they all accurate? I made this recipe today for “girls’ day” with slight variations on veggies due to what I had on hand: Carrots, Bok Choy, green cabbage, jalapeño, and bell pepper. I made the sauce with peanut butter, Chile sauce, and red pepper flake. My best friends and I all LOVED this dish and my friend with Many dietary restrictions said this is the best meal she’s had in months!! Easy as can be. Delicious. I was skeptical but I promise you, it’s worth it! Great! Thanks for sharing your variations, Stevie! Yum. I used chard instead of the collards. I also cooked the tofu separately, because I like my tofu VERY well done. But the whole thing is delicious. of the home-made sauce and paksoy instead of collard greens :) Thank you for sharing this recipe! We haven’t tried, but I think that should work, Cecilia! Let us know how it goes. We made it yesterday and it was GREAT! I added a bit more chard and some zucchini to make up for the lack of cabbage and it turned out delicious. My husband wants to know when I will make it again! Omg I had my doubts when you said this was the best pad Thai you’ve ever had. I’ve had lots of pad Thais too so…I wasn’t sure. But one bite in and I was convinced! So flavorful and delicious! This is one of my favorites of yours! I recently started a program of not eating anything with flour (so, no pasta or rice noodles). Now that I can have noodle-free pad thai, I’m so happy! Thank you! This is super easy and super tasty–and it makes a lot! Definitely more than 2 servings for me. Thanks again! Yay! Glad to hear it, Ken! So flavorful, fresh & easy! I’ve made this several times, definitely a go-to dish now. Yay! We’re glad to hear that, Jackie! Easy recipes for someone who’s starting a plant based lifestyle ?? Hello i have never had Pad Thai in my life.. I made this recipe last night. while i thought it was very tasty it seemed to have a very salty feel to it for me. is this supposed to be sweet yet savory. and does the ingredients you use make a huge difference in taste. the only ingredient i used that was different was tamari from coconut stuff where can i find that ingredient? Hi Rameca! You should be able to find tamari in most grocery stores or even online! Really good. Not a fan of bell peppers so I’ll substitute something else next time – sliced onions perhaps. We didn’t do tofu as we try to avoid soy for health reasons. We did use the ginger (fresh). Very tasty. Trying to make more paleo dishes and was happy to find this. Sauce was delicious. Thank you. I’ve done a number of your recipes and always enjoy them. Would you consider this to be a good recipe for meal prepping? This one is best fresh, but it is ready in just 30 minutes so it makes for a great weeknight meal! This recipe was an A+. It did not take long to prep all the veggies and the sauce, and it was by far some of the best “thai food” I have made on my own at home. I followed the advice of another commenter and made extra sauce, but my boyfriend found it to be too saucy, so if you’re concerned about sauce amounts my guess is the sauce is perfect as is! Your recipes are so amazing, even the most traditional of my meat-eating, Idaho-stock family members love them. While I try to eat plant based the majority of the time, the people I cook with and love still eat the meats, so I appreciate that these recipes can satisfy everyone, and I just cook up a side of free-range, antibiotic/hormone free chicken (like I did for this recipe) those who don’t feel it’s a meal without it. I made this and it was amazing!! Thanks for the inspiration and noodle-free alternative! This is the bomb.com! I made this for a couple friends that have all recently become vegan, and we were all very impressed. Got our Thai fix without that greasy ick feeling at the end of the meal. Will definitely be adding this into the rotation. Thanks! This recipe is a game-changer! I added a bunch more chili-garlic paste and red pepper flakes to kick up the heat and I used all of the vegetables in the recipe as stated. It was so delicious and satisfying! I’ll be busting this one back out for my next houseguests. One of the best vegan dishes I have ever had! Thanks so much for sharing this recipe. It was a winner, and super easy too! You are a genius! I was hoping with all the veggies it would still taste good. IT WAS AMAZING! The sauce and all the different textures really hit the spot. I make at least 2-3 of your recipes a week, they have NEVER disappointed. Thank you!! Yay! We’re so glad you enjoyed it, Anjelica! My husband and I went plant-based about 14 months ago and have made several of your receipes and never disappointed. This one was over the top amazing! The sauce was perfect. The addition of the fresh ginger was a great suggestion. This one will be a go to whenever the urge for take out hits. We love noodles-but this was so good we didn’t miss em. Thanks for sharing!! This recipe is awesome! I’ve made it 4 or 5 times now and it is always a hit. I switch around different veggies depending on what I have on hand (tonight I added zucchini because I didn’t have collard greens). It’s delicious and it makes you feel so good for getting so many veggies in one shot! I am obsessed with this recipe. I make it about once a week (sometimes more!). It is delicious. I sometimes add noodles or other ingredients. This was so good! Colourful and full of flavour. Took awhile to prep but cooking did not take long. Will definitely make again. Would it be ok to leave out the maple syrup? Yes, or you could use coconut sugar in place of it! This was amazing! My husband is pretty over zoodles however he loved the carrot noodles! We subbed lemon juice, regular shredded cabbage and spinach instead of collards as that was what we had on hand and it was just delicious! Thank you for all of these easy delicious recipes, we have loved everything we have cooked from the blog and cookbook!! Thank you for another fabulous dish that is healthy and tasty!! I have made many of your recipes and absolutely LOVE your website!! Many days I come home and go straight to it for tips on what to make for dinner and I am never disappointed. You have a knack of getting just the right blend of flavors with all that healthy goodness! The sauce is especially wonderful! Perfect blend of everything, so simple and I had everything already in the cupboard (no shopping necessary) Bonus! Oh my gosh! I just made this for my lunches this week and I literally scraped down the pan to get everything I could. Delicious, as always! I made with spiralized zucchini, carrot and spinach and added crushed cashews on top. Second night I added normal noodles. Great recipe :) I still have loads! Would it be suitable to freeze? Glad you loved it, Claire! I am not so sure about freezing it but you can certainly refrigerate leftovers. Hope this helps! Yummmm! This was delicious. I made the sauce exactly like Dana’s and it was perfect! With the veg I made a couple of subs with stuff I had at home..
Two medium spiralized sweet potatoes instead of the carrots. Then, I swapped the collard greens for baby kale that I had in my fridge. Also, I didn’t have any tofu. It was tasty without, but next time I make this I think I’ll include tofu for a bit more fun. ;) I cooked everything in a wok, and like someone else commented, the extra space made cooking easier and faster for me. This was so delicious. Didn’t have collard greens, so subbed baby spinach and it worked fine. When I told my meat-eating husband what I was making, I said “I’m making noodle-free pad thai. You’d hate it.” He had to try it the next morning and was about as excited as I was about it. I recommend you with enthusiasm to everyone b/c really, Dana, you’ve never let me down. Like, ever. Thanks for that. Now I just gotta find a way to use less PB so I can eat soooooo much more of it. I made this today and it was easy and fantastic (even my almost 2 year old loved it). It was easy to adjust veggies to use what we had. Another great recipe, thanks so much ! How do you make the ribbon carrots? The look thicker than what my peeler would make. Hi Sarah! It could be the type of vegetable peeler you have! I’m edging my kids to a vegetarian diet and I think they’d like this but they really don’t like almond butter. I’ve tried. Trust me. Is it okay to use peanut butter? Do you think the peanut butter would be too strong? Okay please ignore. I was able to search and see that others did make it w/ peanut butter. Sorry. Hi Kelly! I totally think peanut butter will work! Hope your kids enjoy it! Made this today, but instead of cooking it I ate it as a salad, which was delicious. As a salad the instruction are a little different, but the recipe remains unchanged. To make as a salad mix the sauce with the minced serrano peppers, toasted sesame oil, ginger, and turmeric (if using). Set the sauce aside and prep the vegetables. Once the vegetables are prepared toss them together in a bowl. I cut down on the carrots as they won’t shrink as much as cooking (maybe 2-3 cups instead of 4 cup I kinda did it by feel here). Then mix all of the sauce (turned dressing) with vegetables and let sit for 5 minutes stirring a couple times. This allows the vegetable to soften especially the carrots which end up being kinda noodly once soaked in the dressing. Is it possible to make this ahead and keep for lunch later in the week? This is amazing. I doubled the batch, only substitutions were sriracha for chili garlic, and extra serrano peppers. I added all the optional ingredients and after eating it, brought some to my neighbor who said it’s the best vegetable dish he’s ever had. He asked for the recipe and after sending it, he texted ” Holy crap dude, I never thought vegan food could be good”. Excellent job, and I will be using more of your recipes to up my vegetable intake. This was FANTASTIC!!!!! This is my third carrot recipe I have tried in 2 days. I hated carrots my whole life. Till now. This was spicy, sweet, savory……just delicious. :) Thanks. Tried this out tonight and loved it ! Even my non tofu eating fiancé loved it. Just made this tonight and have to add my rave review to the others. It was fantastic! I do have a question…for a large crowd, could this be made a day ahead and then either heated or served at room temperature the following day? Hi Jane! That should work! I’m on keto diet and wonder where the high carb count comes from in this recipe; is it just maple syrup and carrots that account for the 55 grams?? I made this last night – it was incredible! I added some ingredients to the nut sauce (fresh garlic, fresh ginger, sriracha and extra lime juice) to adjust it to my taste but other than that it was PERFECT! Even the leftovers cold are delicious! Will definitely make again, and again! I just made this and boy am I glad!!! The sauce is so good. I was worried about the collard greens but they tasted fantastic! I doubled the sauce and added some noodles to stretch it out a bit but didn’t change anything else. Yum!!!!! Made this a while ago and totally forgot to comment! This was soooooo sooooo sooo good!!!! Must make again! This is my favourite new recipe! I’ve already made it 5+ times, and actually substitute bok choy for collard greens as I can’t find them anywhere this time of year. Can you suggest other recipes on your site that are similarly hearty/vegetable-y, delicious, and extremely fast/simple, but maybe a different flavour? Thx in advanced and love your site! This recipe is truly delicious! And it is so pretty. I serve it over a crispy nest of soba noodles sauteed in a bit of sesame oil (my husband loves noodles). Yet another wonderful recipe from minimalist baker (my go-to source for dinner recipes)! This recipe is so easy and customizable!! I cannot say enough good things about the sauce, it tastes just like a peanut sauce you would find at a restaurant, only so much cleaner! I am allergic to garlic and have not been able to find a decent garlic-free peanut sauce until now. I used zucchini, carrot, kale, and serrano pepper as the veggies because that is what I had on hand and it turned out amazing. I can’t wait to use the sauce on salad, chicken, and stirfrys. It is a crowd pleaser for sure. Thanks Dana! I did have a question though what is the sauce you have pictured in the little dish? Hi Dani! The sauce is from this recipe! This was wonderful! I have a serious problem with needing pad Thai and this may have saved my life! The carrot noodles gave me the texture I need. After a year and a half vegan I switched back to eating chicken and fish due to some belly fat that just wouldn’t budge so instead of tofu I used a pound of chicken marinated the same. I had to use two pans to cook everything than mixed it all together in a big soup pot at the end. My husband, five year old son and I ate it all. Absolutely delicious and that takeout place ain’t got nothing on this! This was delicious – I wish all my favorite restaurants made something like this. My husband has been toying with going Vegan and while eattting this dish he said – “why wouldn’t I, this tastes satisfying, filling and amazing”. Thank-you for perfecting this vegan Pad Thai. And – those carrots are a great noodle replacement, wonderful mouth experience and carried the sauce well. Thanks for this one! I made it last night and it was fantastic. In case anyone else was wondering, the leftovers from this work really well in a breakfast burrito with extra scrambled tofu or eggs if you eat them. MADE this tonight and LOVED IT! I added a clove of garlic at the same time as the carrots, and used Trader Joe’s power greens mix (spinach, chard, kale) instead of collard greens cause I couldn’t find any! Worked great! Hi!! I made this yesterday with substitutions I had around the house. My guest does not like peanuts so I made it peanut free! I used tahini in the sauce and crushed cashews for the topping. I didn’t have all the vegetables so I used carrots and zucchini as noodles. I added fresh corn. It turned out absolutely amazing !! I am sooooo impressed. The tofu was delicious. I’m obsessed with pad Thai; it’s probably my favourite dish. We order take out a couple times a month. From now on I’ll be making this instead!! Much healthier, very easy and even more delicious. I’ve been following minimalist baker for a couple months and could not be happier with the recipes. Thank you so much !!! I have a food allergy to carrots ?, what do you think would be a great substitution???? Hi Cheri! You could try parsnips, squash, zucchini, or cucumber! Made this today and it was delicious and beautiful! Thanks for sharing! Would a mandolin work just as well for the carrots? Okay, I am APALLED at how much I enjoyed this. I ate the whole thing. THE WHOLE THING. And while I don’t really advise that — that’s quite a lot of peanut butter and sodium to ingest in one meal — I can take solace in the fact that it was basically 100% veggies. I’m going to make this today-can it be served cold?? Thanks!!!! I served room temp & it was amazing!!! Thank you!!! Everyone thought it was sooo delicious!!!! So far, every recipe of yours that I’ve made has been ridiculously healthy simple & incredibly delicious with amazing flavor profiles!!! So glad I found you!!! I just made this recipe and it absolutely delicious. I’m always looking for plant base recipes. I have to say this one hits the spot. THAnk you! By the way I just order your book. I hope the recipes are as delicious as this one and the Cinnabon recipes which is a big hit in my home. I made this tonight and it was fantastic! I added sweet potato noodles to really amp up the feeling of pad thai, and it worked perfectly. I added them in right before adding in the carrots and collard greens. This took me about an hour but it was well worth the investment. I’ve since used the sauce for dipping Spring rolls. BTW, love your cookbook, Everyday Cooking. This dish is amazing and the sauce is dynamite. Adored by 5 carnivores – so that says it all. Dana, I made this last night and am eating it for lunch now–oh. my. goodness. It is fantastic! Can’t wait to make it again for my husband. Thank you for sharing yet another delicious recipe with the masses! I just made this & it was amazing!! So freaking good! We love all the flavors! This was absolutely delicious. My favourite vegan g/f dish I’ve made yet. Thank you for making recipes like this that make it easy for me to stick to a plant-based diet. I never leave comments but had to with this. ?? I don’t usually comment on, well, anything, but I have to tell you this sauce is truly amazing. I saw a link on Reddit to this recipe a few weeks ago and made the sauce in the Vitamix for lunch that very day, mixing it with shirataki angel hair noodles and garnishing with sliced almonds. It was divine. I used maple syrup, substituted Bragg’s Liquid Aminos for the coconut aminos, and added the sesame oil to the sauce in the blender. I’m making it tonight for my family with the veggies as written and I cannot wait. Thanks for the delicious, healthy recipe. It’s a keeper. I made this tonight. I baked some tempeh, and then marinated it in the sauce while prepping the veggies. I used cabbage, ribboned carrots and zucchini, and it was amazing. What a great recipe! I made this for dinner and OMG it is sooo good! Flavor is on point, thank you for this recipe! I just made this! Seriously SO GOOD! I added zucchini noodles and used Kale instead of collards! SO GOOD! I made it a little spicier than I was prepared for – so I added some chick peas in and it is so yummy! Nutty, filling! Delicious! Great Recipe! Made this last night and it was DELICIOUS! SO colorful, flavorful, and healthy. Also really really time consuming. It took me over an hour to make. Cooking time was not long at all, but washing, slicing, peeling, chopping the veggies took an eternity. I think next time won’t take as long now that I know what I’m doing. I would probably also cut down on the soy sauce a bit but I am definitely going to be making again and again. Thank you, Dana! Awesome meal. We made it at the fire house and everyone loved it. And leftovers the following day OMG!!!! Wow the flavor of this is insane! I really think that almond or peanut butter with lime juice and aminos give this a great umami flavor. I followed the recipe except I used soy sauce. SO very flavorful. Thank you! This is a keeper! This is seriously amazing! I used soy and honey in the sauce as it’s what I had in the cupboard and it was delicious. Added some ribboned zucchini in addition to the carrot. Made this tonight for meatless Monday and it was delicious! Made sans tofu and was surprised how filling it was and so tasty. I bought enough ingredients for more than one serving but wondering if you have ideas for how to use red cabbage, collard greens, green onions, and zucchini for another recipe. Absolutely the best vegan recipe I have come across in a while? Love it! followed the sauce directions as directed and it’s straight liquid. Is that normal? It doesn’t resemble a peanut sauce in any way — it’s a very runny, liquidy, sauce. One of the most delicious dinners I have ever made. Also loved by my meat eating boyfriend so you know it has to be good! Really good! I have a soy allergy so I appreciate the coconut aminos! I just made this for dinner and absolutely loved it. Thank you for yet another healthy, quick, and amazingly tasty meal! This was such a fantastic recipe! My family started eating vegan three weeks ago and though my kids are both good eaters, I was curious whether they would adjust well to the diet. They slurped this up hungrily tonight. Definitely one of my favorite recipes of yours so far! Thank you for making becoming vegan easier! I made this last week since I had all the ingredients on hand. The only change was the addition of a pad thai sauce ( tamarind, TJ’s spicy yuzu sauce, soy, ginger, garlic) to give more flavor to the “noodles”. I’m a saucy gal! Served on a bed of fresh greens from the garden. My husband LOVED it! Wants it on regular rotation. It makes a good summer meal served raw or al dente. Is there a vegan substitute you’d recommend for the fish sauce that gives pad thai its signature flavor? This was one of my least successful go’s at a MB recipe, but it was my own doing. I added zucchini noodles to bulk it up/was too lazy to go out and buy collards, but this left even less crunch in the dish. Definitely add the crushed nuts/some kind of seed/bean sprouts to this. Even with all the veg, it desperately needed the crunch contrast in traditional pad thai. Don’t be lazy like me! Get the extra firm tofu and take the time to let the water expel before making the dish. That said, it was still a tasty and flavorful dish as are all your awesome recipes! We love Thai food, and Pad Thai is my husband’s favorite dish. This recipe looks so simple and delicious. I can’t wait to give it a try. The nut butter sauce sounds divine! This is sooo awesome I can’t wait to make it again. Thank you so much Dana you are amazing!!! Hi Nursen! While we all work at different speeds in the kitchen, prep time does not indicate total hands-on prep time, but also includes prep completed while other items are cooking. When shaving your noodles, you will end up with a piece left over and you can thinly chop it to match the thickness of the others (or close to it) Hope this helps! This recipe will definitely be on rotation! I can’t wait to have the leftovers for lunch tomorrow! I made this today and it was great; I tried to use a special peeler that makes long julienne slices for the carrots, but my carrots were not that big (next time I will do the ribbons). I used Gardein vegan Chik strips instead of tofu. This was another delightful dish; I would say it took about 45 minutes to chop and peel vegetables and make the sauce. The cooking time is included. I love the fact I did not need rice or noodles to feel full. Thank you for this dish. Thank you for this amazing recipe! I made this exact; just added some ribboned zuchini as well as I had a couple in the fridge. I also made your cinnamon buns as well…soo good! How can anyone not want to go Vegan with dishes like this? You will see nothing but positive results – I wish people could see that. I am purchasing your book to add to my Vegan collection and I must say, yours will be the one that I will regularly reach for and will probably be covered in food splatters. made this last night – it was friggin’ amazing, and I couldn’t stop picking at the leftovers even though I was ridiculously full. my only complaint is that there’s a TON of salt; I doubled the amount of tofu (thus, doubled the glaze), which brought the total amount of soy sauce used to 7 1/2 tablespoons. yikes. any future recipe users could probably take out at least 2 tablespoons somewhere and it would probably still be just as good. I made this tonight, minus tofu. It was AMAZING and will now be in our regular rotation! So colorful and flavorful! Thank you for creating this fantastic recipe! The sauce, the balance of vegetables are perfect. I used kale and added garlic sauteed shrimp. Cooked the peppers separately to spare my wife The Heat. One complaint: you switch back and forth between measured ingredients (lime juice – how many tablespoons are in a lime? ), cabbage (by the cup – how many cups of cabbages are in a cabbage? ), and whole ingredients (5 collard greens). I prefer the whole ingredient approach. In the frenzied head of a stir-fry, clarity and consistency count. Also LOVE the star wars reference! I made this today and it’s so delicious I’m already looking forward to the next time. I subbed Green Cabbage for the Red, Spinach for Collards, added Zucchini Ribbons and omitted oil. Thanks for yet another delicious recipe. I made it last night and I absolutely loved it… like all the the recipes I’ve tried from your blog so far! You are such a talented minimalist culinary creator ! I regularly recommend your blog to my friends (and even my students) ! Amazing recipe! I used it with leeks, sweet potatoes, white corn, carrots and 2 eggs and 3 whites. Used lemon instead of lime, which requires a bit more coconut sugar and maple syrup-jist a splash…and put the scramble in lettuce wraps! I had to is all the veggies I had before buying specifics for this recipe…I will never need to order take out again. Thank you for all your inspirational ingredients! The sauce was absolutely delicious. I didn’t have most of the veggies, but I poured it over zoodles, grilled red peppers, sungold tomatoes, jalapeños, shishito peppesr, onions and quinoa. I wasn’t in the mood for greens so I used extra cabbage and peppers instead. But wow, this was amazing. So amazing that I ate a batch for lunch and dinner and then prepped another 2 batches as meal prep dinner for the week since I try to keep dinner a low carb meal. Yum, yum, yum. Will definitely be on repeat. veggies and rice noodles. Zucchini, carrots, onions and kale. Delicious!!! Will definitely make again. Just made this recipe for dinner this evening. It was a hit! I don’t think it does, personally. If you’re worried about it, you could some sunflower butter which is less nutty in my opinion. Otherwise, I think you should enjoy it! Hi! It does taste like a nut-based sauce but I would recommend making a different sauce all together rather than skipping the almond butter if you are not crazy about the taste. Love this!! Totally worth turning on the stove on the hottest day of the year (in the PNW, but still ;) ). Had to stop myself from eating all the leftovers before bed. Yum! Made this tonight for my sister and boyfriend (the boyfriend is a carnivore). Instead of scrambling the tofu, we pressed, cubed, baked, and then pan seared 14 oz. of tofu to go on top. Super yum. We ate the whole recipe. I think sweet potato noodles would be amazing here, although I am partial to the collard greens. We also doubled the peanut sauce to serve extra on the side, and served the dish alongside this delicious thai cucumber salad. I am a new vegan. One month yesterday! You are my go to for all recipes delicious and vegan. Pad Thai is my favorite dish. Cheesecake Factory back in the day made a dish with tofu loved it. I was at Trader Joe’s and they have sweet potato ribbons. What do you think of substituting those for the carrots? I think that would work! Definitely a different flavor, but would probably be delicious! My sister and I made this recipe and we loved it! We added a lot of extra veggies and made some extra carrot “noodles” make up for not having some of the veggies that were called for but it was still just as delicious. This recipe will definitely become a regular in our house! Yay! Thanks for sharing, Kathleen! Carrot noodles!! Flippin’ brilliant. My kids ate every bite. I put them in first and used the greens from cauliflower instead of bok choy. So amazing – thank you!! Well THAT was a success!! The peanut sauce changes flavor slightly when cooked …thank goodness bc I was so nervous about it despite many adjustments (which probably brought right back to the original ratio ?). Ginger is a plus/must. THANK YOU!! This was tremendous!!!! We loved every bite and all the flavor depth. WOW! Thanks, Minimalist Baker! We are a big fan of your recipes! Hi Lucy! I would add them at the very end of cooking in a corner of the pan so they can scramble. Then once cooked, toss in with the rest of the dish! Great– this dish was AMAZING!!! Definitely have to try this recipe out as soon as possible. Looks so delicious, thanks for the share! Made this last night and wow this blew me and my friend away! I wasn’t expecting something life changing because all those pretty raw veggies as a main course I wasn’t totally on board with but wow they were the star of the show! Especially the bell peppers which turned out to have such a amazing flavor which the sauce brought out! I’ll definitely be making this very regularly thank you so much! 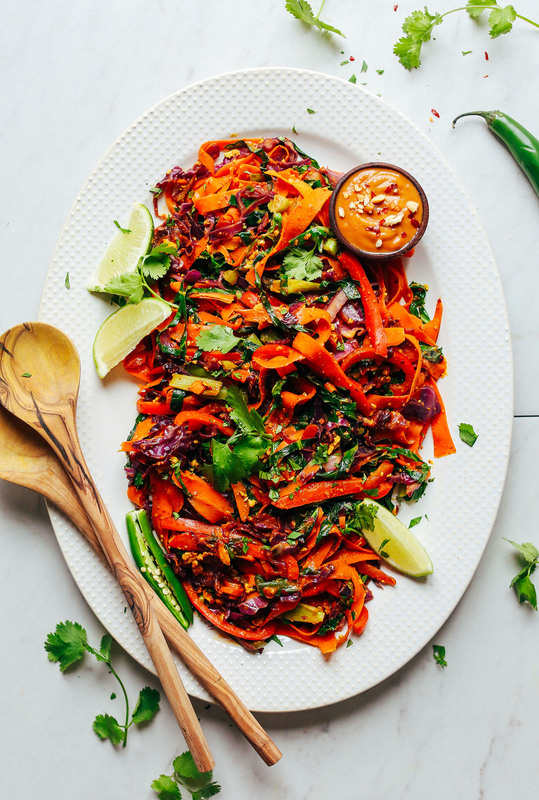 Wow, I never knew that veggie-based Pad Thai could look SO good! I definitely will have my take with tofu. It looks like the perfect dish to meal prep! Can I use Tahini in replacement of nut butter? It will taste totally different, but you can give it a try! Yay!! Thanks for sharing, Carolyn! I forgot to add, I did use a traditional vegetable peeler to make the carrot noodle ribbons which was a first for me. It took me a couple carrots into the process to get the method down. The easiest way for me was to lay the carrot on a cutting board holding the thin end and holding the peeler blade side down and sweeping the peeler blade along the length of the carrot. When it started to get tougher to peel I would rotate the carrot a quarter turn. When finished I was left with larger pieces from each carrot which I will use for another purpose, but the 4 carrots gave me enough ribbons to make the dish. Some things just can’t wait until tomorrow, and this recipe was no exception. After seeing the post, I was smitten with the idea of making a noodle free Pad Thai and later this evening off to the market I went . The promise of the dish in 30 minutes did not seem possible but I was able to prep the ingredients within 20 minutes and cook the dish within 10 minutes and was pleasantly surprised. I did not change much to the recipe but I would definitely make extra sauce for serving on the side (it’s really good/salty/sweet/sour/spicy). The veggies were lightly coated with the sauce so it would be nice to have a bit extra. For cooking, I used a wok and appreciated the extra room to cook this dish in considering the large amount of veggies involved, it made tossing and cooking a breeze. I’m not a huge fan of tofu, but decided to use it in the recipe since it is so commonly found in Pad Thai. Similar to many Thai restaurant versions of Pad Thai, I cubed the extra firm tofu. It was hard to get a nice sear on the tofu cubes even with the veggies pushed to the side of the pan. Next time I will sear the tofu first and remove it from the pan and then add the tofu back at the end with the ginger and sauce to keep the crispy texture. 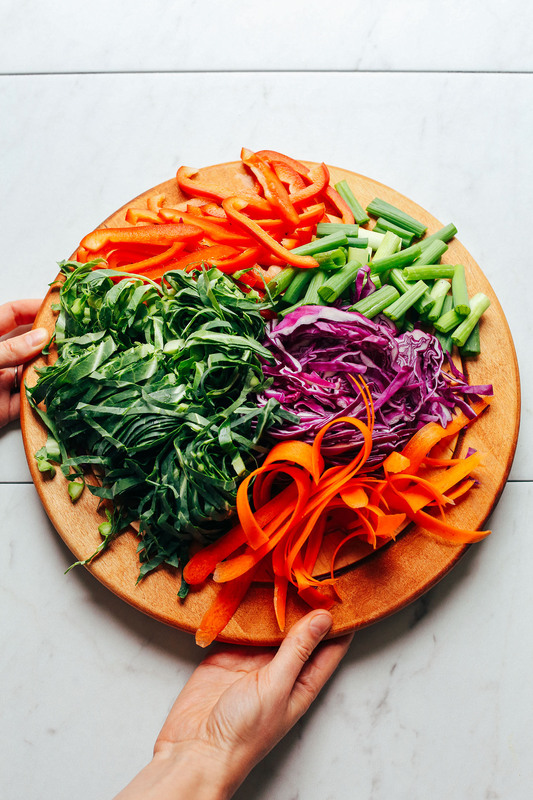 This is one of the most fun and creative ways I’ve had eating my veggies in a while and was thrilled to get so many different veggies packed into this dish! In the past, I’ve made traditional noodle pad thai and spent over an hour just making a traditional sauce. I absolutely loved the simplicity of this recipe and would agree that it is a great stand in for the real thing…and without a doubt much healthier! I’ve found with plant based cooking as long as you use similar herbs, flavors, sauces, you can really recreate some traditional favorites. Keep up the great work Dana, and keep the inspirational recipes coming! You have once again saved the day for me as a new plant based eater. I’m having so much fun with your recipes and appreciate being able to create so many flavorful dishes! Thank you for a really easy and delicious meal. Made this for dinner tonight and we were blown away by how good it was. Subs I used (on hand) spinach instead of collard greens and jalapeño instead of Serrano – worked out great. Loved this! I made it with all green cabbage instead of red, spinach instead of collards, skipped the tofu. I served it with steamed rice. It fed our family of 5 and plenty of leftovers for 2 lunches. Hi, just curious, why do you need to forego the noodles in the first place? Aren’t they already gluten-free? This sounds fabulous and the photography is amazing! We just went to an authentic Thai restaurant over the weekend and had amazing pad thai – I need more! I can’t wait to try this to satisfy my craving. Thank you! I’ll be sure to leave my review once made on the weekend. Blessings to you and your wonderful site!!! Thanks Andie! Let me know how it goes! How did you get the carrots so “noodle” thin? I just made this recipe and it was amazing! thanks for sharing this! Your website is so inspirational, I’ve made so many things and all was super delicious! you are the first blog that I come by that does things completely how I like it! Could you sub apple sauce for the maple syrup? Yes, but it will be slightly more thick and less sweet. I am prediabetic and have to greatly reduce my sugar. Need suitable substitute for maple syrup. Love your recipes. Trying to renew my vegan life style! Is the calorie count including the tofu? Do you think zucchini noodles would be a good sub for the carrot noodles? I do, but know that zucchini noodles won’t be as sweet / flavorful. I am going to try this recipe with carrot noodles next time!! I didn’t have the knife skills for ribbons lol. Yes I tried it it’s so good !!! lol, thanks! Beautiful name, btw // xoxo! Great recipe! I think I am going to forgo the cooking and just have it raw. Lovely! Share how it tastes. This looks amazing! Do you have a good substitute for collard greens? I’m not the biggest fan but would love some green. How about some swiss chard? The leaves are big and thick and have very little flavor. Kale is too bitter. This is so pretty! Can I ask where you bought that white plate? Sure! It’s from West Elm. This looks amazing! I totally need to try this soon! I feel like you could leave out the tofu and add your recipe for peanut marinated tempeh on top if you need a little more protein.